2014 has been a remarkable year filled with not only inspiring art, but also new opportunities for me professionally. I’m happy to announce that I’m the new Director of Communications and Engagement for the Fowler Museum at UCLA, and I hope you will visit me there soon. For those of you unfamiliar with the Museum, the Fowler is the place to go for global art in Los Angeles– it showcases historical and contemporary art from around the world, and admission is always free. I’m looking forward to 2015 and another year of blogging about the best museum offerings in town, as well as sharing behind the scenes stories about my work at the Fowler Museum. I’m especially excited about these upcoming L.A. art happenings in 2015; an exhibition about master painter J.M.W. Turner at the Getty in February (there’s a movie out now about the artist if you want to get prepped), a retrospective about architect Frank Gehry at LACMA in September, and the much anticipated opening of The Broad contemporary museum in the Fall. In the meantime, there’s a lot of great art to see this holiday weekend. Here’s my list of 7 Los Angeles museum picks for Winter 2015 for kids and adults. 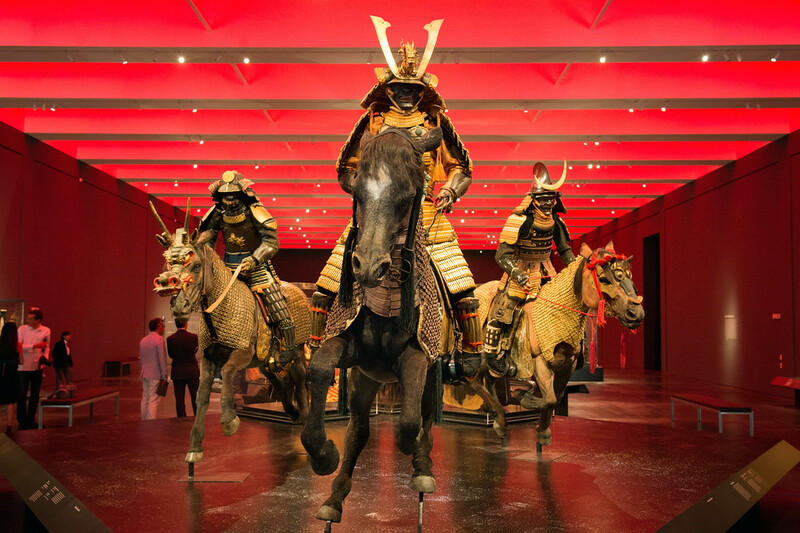 “Samurai” at LACMA. Photo by Michael Owen Baker/Los Angeles Daily News. 1. Ancient Luxury presents a treasure trove of rare Roman silver objects accidentally discovered by a French farmer in 1830. The Getty Villa in Malibu through August 17, 2015. 2. Andy Warhol: Shadows Don’t miss this opportunity to see the first West Coast presentation of Warhol’s Shadows, a monumental painting in 102 parts (top photo). MOCA Grand Avenue through Feb 15, 2015. 3. Grandes Maestros showcases 1,200 pieces of exceptional folk art crafted by the best living artisans in the world. The Natural History Museum through Sept. 13, 2015. 4. Light and Noir is a must-see for film and history buffs of all ages. The exhibition explores how German exiles and émigrés, who fled Nazi Europe, influenced the classic films of Hollywood’s Golden Age such as Casablanca. The Skirball Center through March 1, 2015. 5. Round Trip features forty-two black and white photographs chronicling the epic journey of two young Americans who set off to circle the globe on newly invented “safety” bikes in 1890. The Fowler Museum at UCLA through April 5, 2015. Also be sure to check-out World Share at the Fowler with large-scale contemporary installations by Cameroon-born artist Pascale Mathine Tayou. 6. Spectacular Rubens exhibits a series of monumental tapestries designed by master artist Peter Paul Rubens, plus six striking and newly conserved oil sketches by the artist. The Getty Center Museum through Jan. 11, 2015. And if you visit soon, you can still catch the Getty Center’s festive holiday lights. 7. Samurai Prepare to be wowed by the dramatic installation and spectacular Japanese Samurai battle gear on display in this exhibition (bottom photo). A great choice for family visitors. LACMA through Feb. 1, 2015. Wishing you a happy and art-filled New Year! 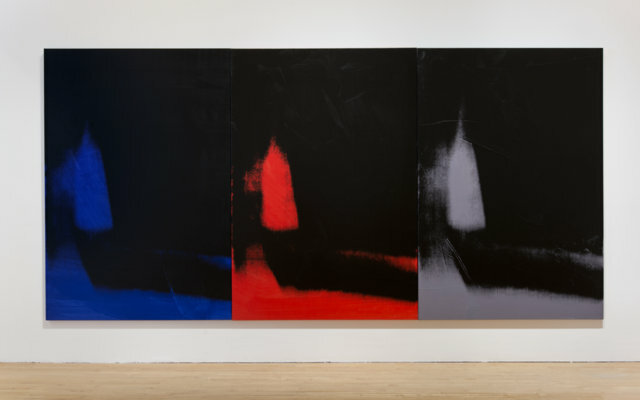 Installation view of “Andy Warhol: Shadows” a the Museum of Contemporary Art. Photo by Brian Forrest. ©2014 The Andy Warhol Foundation for the Visual Arts, Inc. Artists Rights Society (ARS), New)York. Installation view of “Samurai: Japanese Armor from the Ann and Gabriel Barbier-Mueller Collection” at the Los Angeles County Museum of Art. Photo by Michael Owen Baker/Los Angeles Daily News. Posted in Calendar Picks. Tagged as best L.A. museum exhibitions to see, Los Angeles art museum exhibitions, things to do at L.A. museums for the holidays 2014, things to do in L.A.
Congratulations Rowanne! We will surely visit you at the Fowler! I hope you are having a wonderful new year!